On a scenic trail ride, it can be easy to forget about the rest of the world. It’s just you, your horse, the fresh air, and the stunning views. A great experience on public trails depends on good behavior from everyone who uses them. 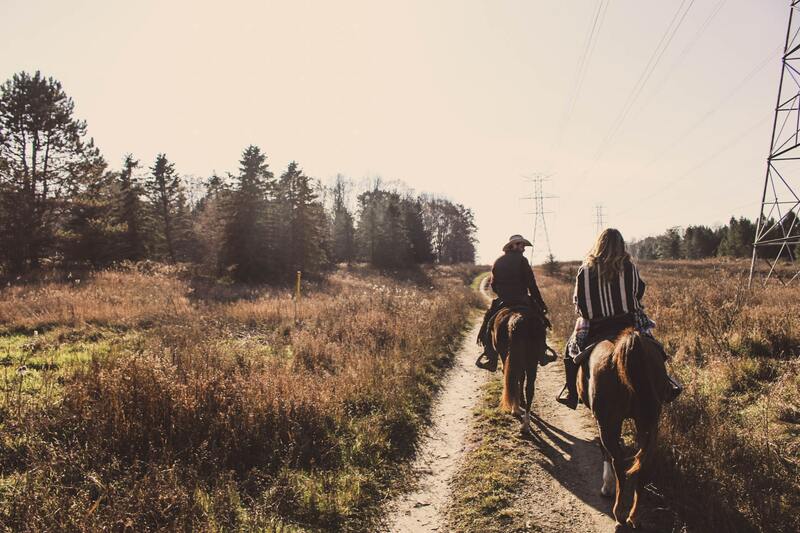 But even if you’re the world’s most considerate person, you might not know all the specific rules of horse trail riding etiquette. That’s what we’re outlining for you today. Below are five of the most important tips for doing your part to keep shared public land accessible, comfortable, and safe for everyone. First, go straight to the source. Your local public lands likely have many established rules, regarding everything from your horse’s health documents to ride permits for very large groups. Try searching “public horseback riding rules [your state]” in Google, and the relevant environmental or recreational agencies will likely pop up. You can also search for the specific public land you plan to ride on, or contact the land manager directly. You probably know this one: “leave a campsite better than you found it.” Try to keep the same mindset as much as possible when horseback riding on public lands. Using a “tree saver” when tying up horses. These stretch between two trees or posts, so horses don’t damage the trees by rubbing, pulling, or nibbling. Closing gates that you had to open to pass through. Disposing of manure in small shared areas such as parking lots, scenic outlooks, or trail entrances/exits. You should also avoid riding on soft or moist ground so that it doesn’t get trampled. Consider this even when planning your next trail ride, especially if there was heavy rain recently–you can contact the park or land manager to confirm that there are durable trails you can access for a ride. You never know whose beautiful meadow you might mow down when you cut across an established trail. Further, don’t stray onto walking trails and other paths not designated for horseback riding. Not only is this good etiquette, it’s safer for your horse. Put inexperienced riders in the middle of the group, and defer to the least experienced rider’s gait and pace. When you have enough space, avoid riding single-file to prevent wearing a rut into the trail. Use your “trail voices.” Don’t be rowdy and obnoxious! Don’t forget that you’re not the only one on the trail! Leave space for runners and bikers to pass you–and be considerate when passing walkers, too. If you’re in a group, pass in a steady, single-file line. Announce yourself to the people you’re about to pass before you do so. Plus, it never hurts to give a friendly smile and wave! Ready to plan your next ride? Blue Ridge Trailers will help you choose the perfect trailer rental or purchase for you and your horses. Contact us online or at (434) 985-4151.